Between last night and this morning I made six trays of fudge as Valentine gifts. Three White Chocolate Walnut, two Chocolate Walnut and one Maple Walnut. Each tray weighs just under two and half pounds. Four are being mailed east, one is for Matt and Dana and since the White Chocolate Walnut is my favourite, I'm keeping one of those for us. Note: For Chocolate fudge substitute semi-sweet or dark chocolate for the White. Add the two sugars, butter, cream, syrup and salt into a sauce pan. Place over medium heat. Stir while bringing to a boil. Lower the heat and continue to stir slowly while the mixture cooks. After about 7 minutes, test by pouring a small amount into some cold water. You want it to form a soft ball. (about 235°F to 238°F on a candy thermometer) When it reaches soft ball stage, remove from the heat, and let rest for about 10 minutes. Add the two sugars, butter and cream maple syrup and salt into a sauce pan. Place over medium heat. Stir while bringing to a boil. Lower the heat and continue to stir slowly while the mixture cooks. After about 7 minutes, test by pouring a small amount into some cold water. You want it to form a soft ball. You might need to cook it for another minute or two. Remove from the heat, add a couple of teaspoons of vanilla and start stirring. 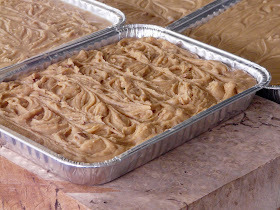 It takes about 14 or 15 minutes for the fudge to cool and thicken. Pour into buttered dish. TIP: If you let the fudge sit for 10 minutes after removing from the heat and allow it to cool slightly this will reduce the stirring time. Option: Replace the cream and cup of white sugar with one can of Sweetened Condensed Milk and increase the maple syrup to 1 cup. Ann, what fortunate recipients to be gifted your fudge. It looks absolutely delicious. Now you have me hungry for it!! Great idea for Valentine's. I make so much at Christmas, I tend to forget how much people love it. Thank you! I cannot believe the look of these..Ann and The Willy Wonka Fudge Factory:) They look better than the fudge specialty shops we encounter on trips..I love it!Of course you are saving one for you:) Over the top! I would love to get one of these from my Valentine Ann! I love making fudge. My son is flying from Ottawa for Reading week and I have to make a pan just for him. OMG! Can I be yours? I think LA is a little east of you! Just landed here, a comment on my blog took me to two places before I arrived here, and I am loving it... wow.. this is great. I am Lebanese , living in North Bay, Ontario. My husband will be over the clouds for these. Well the four going east were sent via UPS yesterday so they should have it by tomorrow and I hand delivered Matt and Dana's yesterday. They ended up with their tray as well as our tray minus 4 pieces. I knew if I kept ours it would be gone in a day. 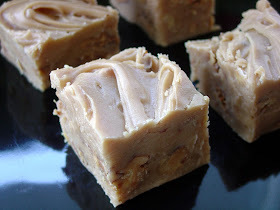 Okay so now you know I have no will power when it comes to White Chocolate Walnut fudge. Thank you for your comments. I really do appreciate you taking the time to visit and comment on my blog. Hi Arlette, Welcome. I can't wait to check out some of your Lebanese recipes. What great gifts!That fudge sounds and looks really good! Thanks for the fudge! It sure is delicious. Good thing it is at Matt's house or I would have eaten the whole tray for breakfast. I have a sugar rush just looking at these beautiful photos. 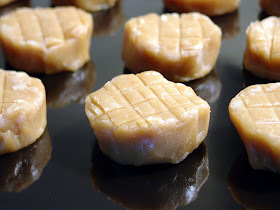 I think we'd be crazy mad over the maple cream fudge. Bookmarked! Still laughing over 2 Stews and Kathleen's comments! When you say "cream", are you using half and half, heavy whipping cream or another type? I want to get it right. Looks so good. I just found your blog on pinterest! Looks great! Have you ever put it in the freezer and then used it a few days later? thanks! I just found your blog on Pinterest.com. Thanks for an amazing recipe. It looks amazing. Have you ever made this and put it in the freezer and used it a few days later? I just keep it in the fridge. I must admit though it doesn't last long. My husband just tried to make the fudge... Both of us thought that it said 4 cups maple syrup because it runs onto the word butter and we couldn't see it. Tonya, Thank you so much for bringing this to my attention. I've had a lot of positive feedback from followers who have made this fudge and you are the first to let me know about the error. I appreciate you taking the time to let me know. It is now fixed. Followed your recipe, used a candy thermometer, cooking to 238 degrees. I let it set for 10 minutes, then stirred for about 5 minutes before pouring into pan to set. My fudge didn't seem to set up very firmly....any suggestions? It could be slightly undercooked or more likely you didn't beat it long enough. You really can't make fudge by "time". It is more about feel. The times listed are "abouts" to give you some idea. But time will vary depending on many things, including weather. I use the cold water test to test for "soft ball" stage. And you want to beat the fudge until just as it starts to lose its shine. When it starts to dull that is when you want to pour into a buttered dish. Fudge really is one of those things that requires practice. But at least the mistakes taste wonderful. Please don't give up. 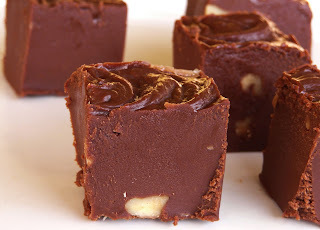 Can you tell me what you do to get the quantity of fudge shown in the pictures? I doubled the recipe and got a 9X9 pan, am I doing something wrong? What kind of maple syrup do u use ? Corttney, I'm not sure what you mean. Are you referring to Grade or whether I use pure maple syrup? I do use 100% pure maple syrup. Just what ever I have on hand which is usually light or medium grade. 1 can of condensed milk, but what size? so interesting might just do this for my mom's lunch gathering. Storm, here in Canada, I've only seen sweetened condensed milk in one size cans. I buy Eagle Brand and the can is 300ml which is about 10 ounces. I made your fudge last Christmas as gifts and it was wonderful. 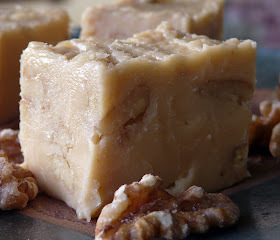 We found the maple fudge turned out slightly granular and a little softer than ideal, but the white chocolate walnut was thick and creamy and perfect. We loved it! If you have any tips for getting the maple to turn out the same way as the white chocolate walnut I'd be interested. Thanks so much for sharing these recipes! What size pan/dish do I use to pour fudge in to set up? what kind of cream is used? 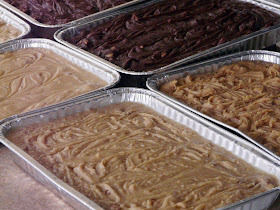 I have never made fudge before ans would like to make it for xmas gifts..."keeping my fingers crossed". I prefer to use shallow narrow pans. I like a thick piece of fudge. But you can use an eight inch square pan. The fudge just won't be as thick. So Cute Idea.This Valentine's Day,everything you need is love.Stunning fudge is putting it mildly!Fudge is a silky smooth Valentine's Day idea that is thoughtful,personal and ever so sweet.Without a doubt to win over your loved one's heart.Thanks a lot.